We know that bed bugs are resistant to wishful thinking, but now they may be developing an immunity to something much more serious: neonicotinoids, or neonics, the most widely used group of insecticides. According to a new study published in the Journal of Medical Entomology, bed bug populations in Cincinnati and Michigan required concentrations more than 1,000 times greater than non-resistant bed bugs in order to be killed. The implications of the findings are huge, as millions of dollars have been invested in insecticides designed to kill these blood-sucking creatures that infest everything from couches to suitcases. It's also a problem of its own making, as the overuse of insecticides is what allows bed bug populations to develop resistance to certain compounds. "While we all want a powerful tool to fight bed bug infestations, what we are using as a chemical intervention is not working as effectively it was designed and, in turn, people are spending a lot of money on products that aren't working," said Troy Anderson, an assistant professor of entomology in the Virginia Tech College of Agriculture and Life Sciences and co-author of the study. Anderson and Alvaro Romero, an assistant professor of entomology at New Mexico State University, reached their conclusions by comparing bed bugs that had been widely exposed to neonics to a colony that has been isolated for 30 years in a lab. The bed bugs in the lab, which have thrived there since before these insecticides were used, died when exposed to a very small dose of neonics. For instance, it took 0.3 nanograms of a substance called acetamiprid to kill 50% of the non-resistant bedbugs. It took more than 10,000 nanograms to kill 50% of the Michigan and Cincinnati bedbugs. In another example, it took just 2.3 nanograms of imidacloprid to kill 50% of the lab bugs, but it took 1,064 nanograms to kill the Michigan bed bugs and 365 nanograms to kill the Cincinnati bed bugs. "Unfortunately, the insecticides we were hoping would help solve some of our bed bug problems are no longer as effective as they used to be, so we need to reevaluate some of our strategies for fighting them," said Anderson. A bed bug, walking on someone's skin, most likely while they are asleep. And continue to fight them we must. Bed bugs are small, parasitic insects that feed entirely on human and animal blood, which they extract while the subjects are sleeping. They can go several months without a "blood meal," and infestations, which can happen in homes, offices, and hotels, are very hard to get rid of. According to the Centers for Disease Control and Prevention, the presence of bed bugs "has recently been spreading rapidly in parts of the United States, Canada, the United Kingdom, and other parts of Europe. Bed bugs have been found in five-star hotels and resorts and their presence is not determined by the cleanliness of the living conditions where they are found." This is not the first time bed bugs have risen to the challenge of overcoming insecticides. According to the BBC, the use of DDT and other compounds in the 1940s and 50s helped to cull their populations, only to see them develop a resistance to the insecticides by the 1960s. Then they also developed a resistance to pyrethroids, a subsequent type of chemical used to kill them. 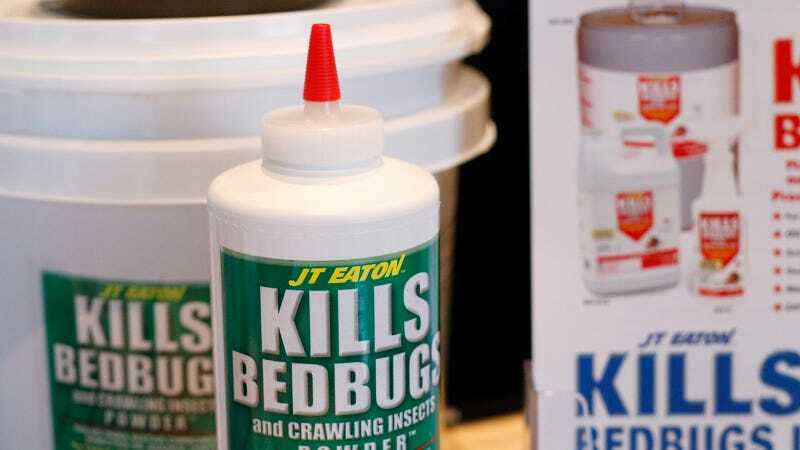 If bed bugs are indeed developing a resistance to neonics, as the study suggests is happening at least in parts of the United States, a new chemical to curtail their growth is yet to enter the picture. Because of this and of bed bugs' quick ability to evolve defenses to poisons, Romero suggests it might be time to rely less on chemicals. "We need to emphasise that we need to use different tools—we can't depend totally on chemicals, we need to incorporate other alternatives," he said. "The pest control industry is incorporating new tools, heat, vapor, encasement, there are a bunch of these non-chemical methods that definitely help." And then there's always wishful thinking.